For years, enthusiasts have asked VW to bring the fast, frugal turbo diesel Golf to the states. 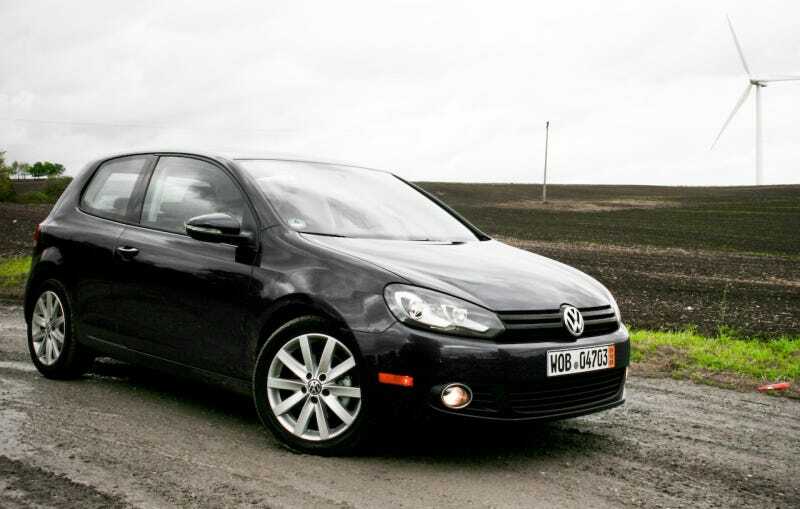 The 2010 VW Golf TDI doesn't give us exactly what we want, it gives us that and a whole lot more. VW wanted me to drive the new 2010 Golf so badly they flew me out to a land pronounced Ger-mah-nee, put me up in a hotel and fed me schnitzel. OK, maybe not schnitzel, but it was probably pretty good. I have no idea as I'm so jet-lagged I can hardly see straight. Let's get the numbers out of the way first. When equipped with the DSG manumatic gearbox, the Golf TDI returns a seriously impressive, EPA certified 31 MPG city, 42 MPG highway. In comparison, the smaller 2010 Honda Insight hybrid does 40/43. Unlike that Insight, the Golf TDI is pretty fast, running 0-60 MPH in 8.6 seconds and topping out around 130 MPH. Well, that's as fast as I could get it to go on the Autobahn near Wolfsburg earlier today. Equipped with this diesel engine, the Golf starts at just $21,990. Standard equipment includes a 5-speed manual transmission and lowered, stiffened sport suspension and a touch-screen audio interface with Sirius satellite radio. The version I drove today was essentially that base 2-door model with the addition of Sat/Nav. Sticking with the manual gearbox, as any keen driver will want to do, means your official mileage number comes down to 30/41 MPG. This MK VI Golf, launched in Europe last fall, is essentially the same chassis as the MK V, but updated to address concerns with dull looks, somewhat poor interior quality and a lackluster driving experience. The amorphous MK V exterior has been replaced with more sharp lines and soft curves, as well as more aggressive headlamps and Walter de'Silva's new corporate face. The interior initially looks somewhat spartan, but all that black plastic is very high quality and bolted down so tightly it feels like you could rampage with a baseball bat without so much as marking any surfaces. There's also new seats covered in a checked white cloth. Those are firm, supportive and immensely comfortable. The standard touch screen helps with the impression of quality too. In fact, the whole thing feels like the robust VW interiors of the ‘80s, just updated with 2009 gadgets. As for the driving experience, well, while I was doing over 120 MPH, I casually asked my passenger how fast he thought we were going. His honest answer was 80 MPH. Equipped with the sports suspension the MK VI Golf is rock solid at speed, corners with a near complete absence of body roll, changes direction quickly and has very communicative steering for a front-wheel drive car. All that, but it still manages to absorb bumps and ruts like a luxury car. Thank the stiffened body structure for a lot of that. It's also very quiet at speed, with wind noise around the mirrors only becoming noticeable above 110 MPH. You can carry on a normal volume conversation even while maxed out. Thanks to the insulated firewall and hood liner, you never detect in aural sign that you're driving a diesel. The common rail direct injection 2.0-liter turbo diesel is shared with the Jetta TDI and develops 236 Lb-Ft of torque from 1,750-2,500 RPM and 140 HP at 4,000 RPM. That flexibility is really felt while driving, allowing fifth gear to pull strongly from 60 all the way to 120 MPH and providing plenty of in-gear acceleration for overtaking and exiting corners. We love the manual transmission combined with this engine because it allows us to exploit that flexibility to its fullest, something that our previous experience with DSG operation in automatic mode doesn't manage. We also prefer the two-door model for its sharp looks, but rear seat accommodation is noticeably tighter than the four-door, which can seat 6-foot adults comfortable in both rows. The Golf is an iconic car in Europe, where it's been the de facto mode of practical, economical, fun transportation since the ‘70s. Due to a couple wide-of-the-mark generations and limited choice of specification, the Golf (occasionally known as the Rabbit) has drifted out of mainstream consciousness here. With that $21,995 starting price, the 42 MPG highway fuel economy, sharp looks, seriously nice interior and a responsive chassis, this new Golf TDI makes more expensive cars look frivolous and direct rivals look behind the times. In short, the diesel engine and the host of refinements make the Golf not just a people's car, but a car people are going to want to buy.